Poland is the fourth largest steel producer in the EU and 19th largest globally. Domestic steel production is dominated by large global players like ArcelorMittal. Along the value chain, between mills and final consumers of steel, (construction, automotive, household appliance sectors) there are a lot of specialised manufacturers and distributors which process steel and metal goods for final use. After two years of decreasing demand, the steel/metals market started to rebound in 2014, mainly due to a recovery in construction activity, with lots of new projects started. In the residential buildings segment, many new blocks of flats and offices are currently being built. At the same time, major public investment projects using EU funds have started or are about to be launched, mainly to improve railways, roads and to renovate pipelines. Steel and metals demand will also be supported by an expected surge in car production, e.g. Volkswagen (VW) is currently building a new factory in Poland to produce the VW Crafter. Domestic steel production increased 8% in 2014, to 8.6 million tonnes, while steel consumption increased 17%, to 12.2 million tonnes. In H1 of 2015, Polish mills manufactured 4.9 million tonnes of steel, a year-on-year increase of 17%. 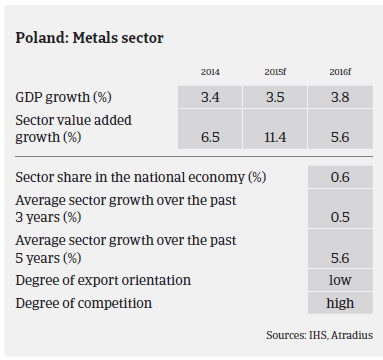 That said, competition in the Polish market is fierce, especially in the steel and metals distribution segment as increased imports from Eastern European and Asian competitors can affect profit margins of Polish businesses. The costs of complying with high EU environmental standards put Polish producers at a disadvantage to non-EU producers. 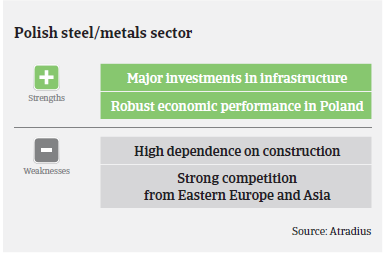 Polish steel/metals businesses benefit from some preferential treatment: e.g. for pipeline tenders there is often the precondition that a minimum of 50% of materials used (pipes) should be produced in the EU. At the same time, the Polish government announced lower electricity excise duties for industries with high consumption, including the steel sector. Access to bank financing remains somehow restrained for Polish steel/metals businesses, but has improved lately. While the level of protracted payments is still high in the industry, no increase in non-payments is expected in the coming months. 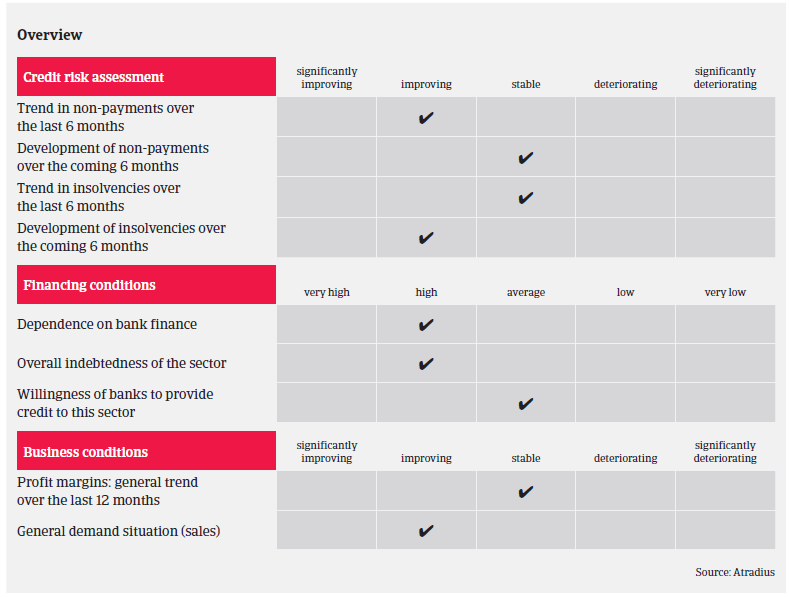 Insolvencies are expected to decrease due to the currently more benign business environment. Weaker players left the market in previous crisis years and it seems that the surviving businesses are financially more resilient. While our underwriting stance was generally restrictive in previous years, we have partly relaxed this stance since H1 of 2014 to cautious, given the rebound of the steel and metals sectors. However, we are still more restrictive on steel and metals businesses involved in railway tenders (due to payment backlogs) and the mining industry (due liquidity troubles in this segment). In the steel service subsector, caution is advised as businesses´ margins have significantly deteriorated over the last couple of years. Generally, we demand a third-party guarantee on buyer companies which have only been active for one or two years.